New! “Romancing the Rose” on Plexi-Glass Modern Contemporary Art. The Plexi-Glass shine adds vivid color pop. Joyful art captures a Beautiful lush Red Rose of Love surrounded purple daisies twisting/turning around romancing the rose. Additional butterfly details, Monarch and Glass butterflies, lady bug, leaves and berries capturing the composition with exciting color and beauty. Nature is our world of glory. Celebrating the incredible gifts our earth sends us to brighten our lives especially when you can express your self within you home. “Romancing the Rose” on Plexi- Glass just wants you to have fun, parties enjoy your life. New! “Romancing the Rose” on Plexi-Glass Unique Art for that very special person. Organic energy circular movement is captivating. Combining details, placing flowers moving everything into position in a circular movement turned out to be a beautiful decision. Creating “Romancing the Rose” Pastel Painting original took five months. Starting researching flowers, butterflies, combining all the details within a pencil sketch to scale ironing out the layout. 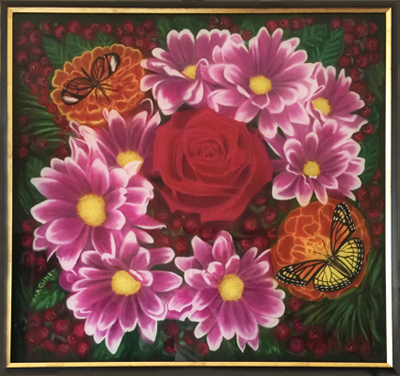 Sketching complicated paintings organizes and defines the flower placement that surround the center rose including leaves and festive red berries all comes together in a rich exciting powerful work of art. Painting with pastel requires relaxing staying with the moment with concentration to the task. After finishing the original taking a chance with the plexi-glass was a great decision. “Romancing the Rose” on Plexi-Glass is spectacular and a focal point of joy!